ON7YK - (ex)ON1ABO - (ex)ON7CB - C5YK - C5S - (ex)C56YK. 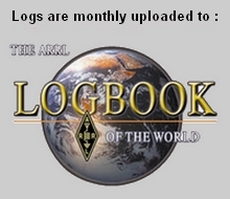 If you are not in the log use mycontactpage for more information . Please don't put my callsign or name etc....on Youtube or in some database . I make a collection of all Gambian call sign , used since the beginning of ham radio activity in The Gambia. Started with the call signs : ZD3 ( old Gambian DXCC) and later with C5 (Gambian DXCC) . Are you the owner of a real Gambian callsign, would it be possible to send me a digital copy of the front of the QSL card by mail ,or my adresse see on qrz.com. My sincere thanks to all the ham's for their help. To all ham's : I do NOT collect $$$ for qsl direct but I have no choice to ask green stamps ($) because my postoffice in my village in Belgium don't accept IRC anymore : Please understanding !!!!! !